Departures every hours after closing slope: 5.00 pm, 6.10 pm, 7.20 pm, 8.30 pm. Reservation compulsory for the Chalet SNOW PANTHERS, in Plagne Centre, on the snowfront (underneath the Funiplagne Gondola). 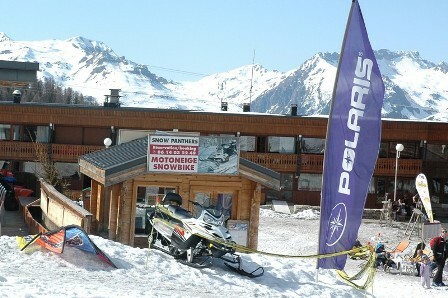 Price for 1 snowmobile: 95 € for 1 h, driver with passenger or not. Price passenger’s guide :30€ for 1 h.
* from Plagne Centre : we are located on the snow front, underneath the Funiplagne Gondola. 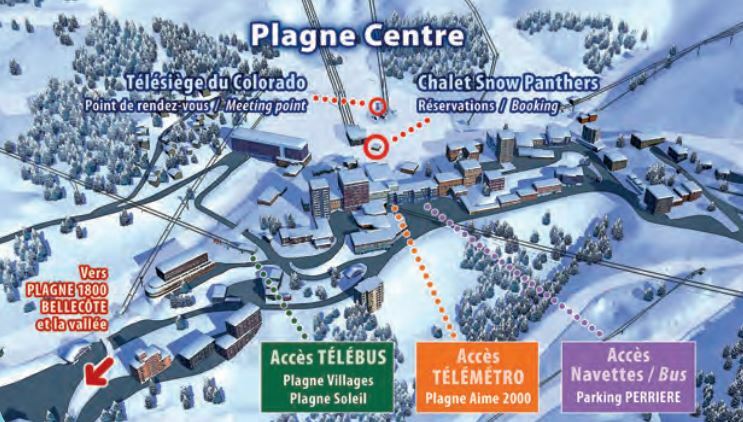 * from Plagne Village : thanks to the Telebus, you can easily reach Plagne-Centre. Then you get to Snow-Panthers Chalet by the snow front or the mall. * from Plagne Soleil : catch the bus to Plagne Village, then from there get to the Telebus to Plagne Centre. Or, walk through the piste to the mobile-home park of Plagne Village, there take the Telebus to Plagne Centre. * from Plagne Aime 2000 : catch the Telemetro to Plagne Centre, then walk across the mall to reach the snow front. 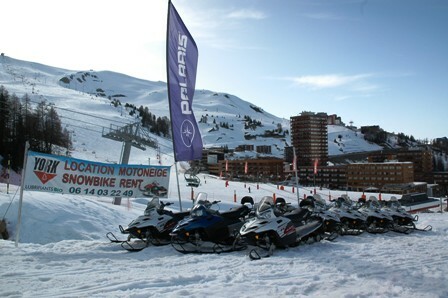 * from Plagne 1800 and Plagne Bellecôte : catch the shuttle from one of the different bus stop to get to Plagne Centre. * By car, follow the direction LA PLAGNE, then PLAGNE CENTRE as far as the Albert Perriere car-park which is in the middle of the ski resort. Then, you will find the Restaurant LES COCOTTES just on the other side of the building. Snow Panthers Chalet is just beside the Restaurant.